HomeBots with Brains: The Future of Robotics is… Modular? Some of us may think of robots as machines we’ve created to mimic human or animal motion, gait, gestures and forms. They are also very often designed to manipulate things in a way that approximates the human ability to do so, in order to complete tasks and automated processes. However, there are engineers and scientists who assert that robots would be more effective, adaptable and useful if they conformed to more unique or interchangeable form factors. These researchers envision a type of modular robot that adds or disposes of components to optimise its form (or motor functions) to complete a range of different tasks. These robots also need to identify these activities and adjust their conformation by themselves. In order to do this though, they would require their own autonomous ‘nervous system’ as well. This ‘robot brain’ is designed to suit their modularity and be able to ‘repair’ itself at need. Marco Dorigo and his trans-institutional team have designed just such a modular robotic system, and have presented it in a paper published in the September 2017 edition of Nature Communications. This team of researchers have come together from the Free University of Bruxelles in Belgium, the Institute for Telecommunications in Lisbon and the Microinformatics Institute at the Federal College of Lausanne in Switzerland to create a new line of robots, operated by what they call the ‘mergeable nervous system (MNS)’. 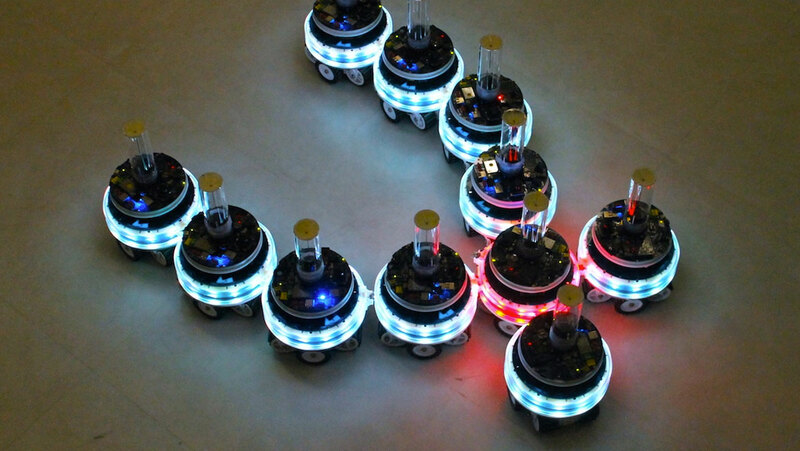 The MNS is loaded onto a small fleet of identical robots that can move independently, and click together using specially-designed connectors to form a larger, modular robot that can change in size and shape to complete tasks and locate targets in two-dimensional space. The MNS works something like a biological nervous system, in that impulses are transmitted through all the modules in one merged robot to effect motion or behaviour. Unlike a human nervous system, however, the control centre or ‘brain’, may be interchangeable between modules and even replaced, depending on the situation the entire MNS finds itself in. The MNS ‘brain’ is housed in one particular module of a merged robot, which determines where the entire robot goes and what it does. It does this by ‘deciding’ which shape the robot takes, which affects the nature of its movement and also what tasks it can perform. The research team programmed the MNS so that each individual sub-unit, which can be a precursor for each new robot, is a ‘brain’ unit. The modules then connect, using a decision system known as a ‘rooted tree’ topology, which in turn determines which sub-unit is going to be the brain unit of the entire robot. Each robot may be composed of at least four sub-units. Once this has been established, the brain then sends impulses that result in the completion of various simple tasks. For example, there may be an experimental ‘stimulus’ in the vicinity of the completed robot, which induces the robot to point towards it. Therefore, the ‘brain’ signals the robot to form an arrowhead, with itself at the apex, and moves accordingly. The MNS is also self-regulating; meaning that if the same robot comes too close to the stimulus, it will assume a second form, or even split into two forms, that help it move an appropriate distance away in the most efficient manner. Each MNS sub-unit is equipped with LEDs, which light up while pointing at a stimulus in a complete robot. The system is programmed so that only the LEDs in the units closest to a stimulus should activate while doing so, which demonstrates the control of the ‘brain’ unit over one complete robot. The MNS also includes contingencies for ‘nervous system damage’ in complete robots. An experimentally-induced fault in a brain unit is detected by all the ‘child’ units connected to it. In such an event, these units are programmed to detach from, and abandon the ‘damaged’ brain and become the brain for the new sub-robot created as a result. These sub-robots may then merge with other nearby units, in accordance with the high-level logic that defines overall MNS behaviour. Each MNS robot sub-unit is equipped with cameras and sensors that help it detect other units and stimuli in its vicinity. The modules move using innovative hybrid track-wheels, form robots using proprietary connectors, and also have a magnetic ‘gripper’ that can manipulate ferromagnetic objects. The MNS works so well because each individual robot is programmed with all the same behavioural patterns and permutations of robotic conformation a complete modular robot should employ in response to the same stimuli. In other words, it effectively mimics motor control in response to sensory stimulation, as a nervous system found in nature might. Therefore, each ‘child’ unit co-ordinates smoothly with the unit that has become the ‘brain’, so that they can change shape and move in a way that is appropriate to each given stimulus. The scientists reported that an MNS robot was capable of completing the tasks of either pointing at a stimulus or moving away from it if it was too close, as mentioned above. However, there may be potential for the system to complete other tasks that also increase in complexity over time. The MNS, as developed by Marco Dorigo and his team across a number of European engineering schools, demonstrates a system of modular units that can connect to form an autonomous robot with a centralised ‘brain’ that determines its behaviour. This system also indicates the potential for robotics to mimic or even surpass the morphological capabilities found in nature. Scientists like Dorigo conclude that this will enhance robotic applications in the future. This experimental system also suggests that robotic design would benefit from more flexibility beyond conventional, human-based morphologies. The MNS system implies the possibility of autonomy for modular robots that could be scaled up in a manner determined by the shape of the individual sub-units. It also suggests the possibility of autonomy for other robot types that would benefit from independent, automatic task completion. These may include robots employed in space exploration-related applications and medical nano-bots that could be programmed to seek out and destroy anomalies such as harmful microbes or tumours. Mathews N, Christensen AL, O’Grady R, Mondada F, Dorigo M. Mergeable nervous systems for robots. Nature Communications. 2017;8(1):439. Pfeifer R, Lungarella M, Iida F. Self-organization, embodiment, and biologically inspired robotics. Science (New York, NY). 2007;318(5853):1088-93.